You know those times a book simply screams your name and you have to drop everything else and read it? Well, that is what happened when I saw Liar appear on my kindle. I have been looking forward to another of K.L. Slater‘s psychological thrillers ever since I finished Blink, and this one has definitely turned out to be another masterpiece. Fast-paced, well written and enjoyable prose, unreliable characters, many many plot twists, an explosive ending… Liar has simply the full psychological thriller package! I’ve read stories about the mother-in-law-daugher-in-law and stepmother relationship before, but I think this one might just be the best one yet. Especially the first one is portrayed brilliantly in this newest story and both Amber and Judi’s character are both realistic, well developed and highly unreliable. This ‘unreliable narrator’ technique doesn’t always work in stories, but was very well executed in Liar and resulted in some very shocking plot twists. There is no way the explosive ending will not completely shock and surprise you! Secrets, plot twists, unreliable characters, suspense… This story will have you in its claws from the very first page and won’t let you go until the very end! If you like the genre, add this to your wishlist. You’ll be in for a treat. This entry was posted in 2017, 4.5 Star Rating, ARC, Book Reviews, Netgalley and tagged 4.5 star rating, arc, book review, family, fiction, k.l. 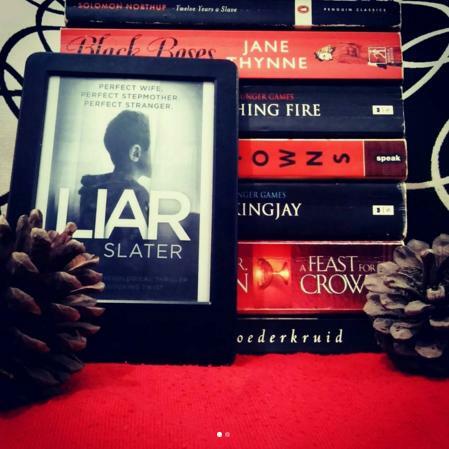 slater, liar, mystery, Netgalley, psychological thriller, published in 2017, suspense, thriller by Yvo. Bookmark the permalink. I’ve read a few psychological thrillers but this one definitely sounds way above average! I’m adding this one on top of Blink and hope I’ll be able to read them soon (before a third comes out)! Both are excellent reads! I hope you will enjoy them. OMG I should not have read this review, it makes me want to forget my reading list and get to Liar asap!!! FANTASTIC REVIEW! Great write up! I’m waiting for my request on Net Galley and I’m so hoping to read it soon!! I hope you will be able to get/start it soon! It just came in this morning! So excited. Oh wow Yvo. I just got the ARC from NetGalley. Tempted to read it straight away. Great review! Excellent news! You’ll be in for a treat with this one; I still can’t decide between Liar and Blink for new favorite.